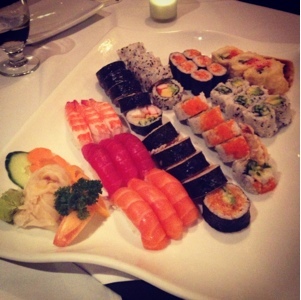 I have always been a huge sushi fan, well maybe that's not entirely true. Let me re- phrase, since the first time I was forced to try sushi I was addicted at first bite. I was six and my taste buds and mind hadn't full grasped the idea that raw fish is absolutely amazing, but after one bite i was hooked. From then on I was determined to try all different sorts of sushi and eat at as many sushi restaurants as possible. 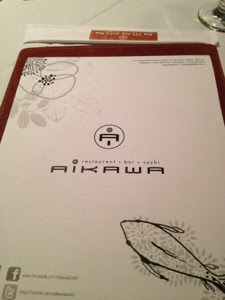 This night, we decided to re-visit Aikawa sushi. We began our meal by glancing over the menu and of course checking-in on Four-Square where I was quickly notified that as a first time check-in I was entitled to a free Veggie Tempura starter, so I gladly took advantage of that little surprise. 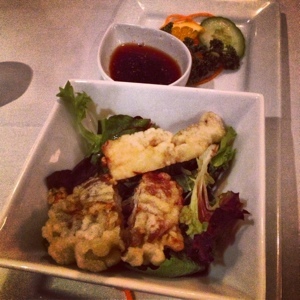 We ordered the veggie tempura appetizer, grilled calamari and deep fried soft shell crab. There must have been a confusion as the waitress arrived with both the shrimp tempura appetizer and the veggie tempura one. We quickly informed her that we hadn't ordered both and she was very confused and apologetic and removed the shrimp tempura app. I saw her talking to the manager about the confusion and instead of giving it to us on the house, as some other places have done in the past, she brought it back to the kitchen - I just hope they didn't serve it to someone else later. We started on the veggie tempura and the deep fried soft shell crab. 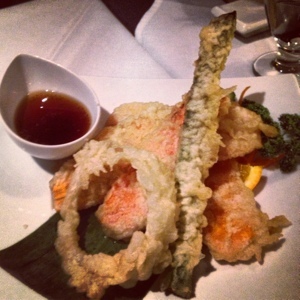 The veggie tempura was delicious; lightly battered and perfectly crispy. The only downfall to this dish was the size of the sweet potato they served. It is absolutely ginormous and has to be cut with a knife in order to eat it. Besides that the dish was excellent. The soft shell crab on the other hand was a huge disappointment. I am a huge lover of soft shell crab and have never had one that I didn't enjoy, this one was almost inedible. Both my sisters could not eat it, I had only two small pieces and gave up. The deep fried batter had absolutely no flavour and was on the soggy side, not very crispy at all. The crab itself had a very, and I mean very, fishy taste and very chewy, it did not taste fresh at all. We definitely wont be ordering this dish again. To be honest, I am not even certain if it really was soft shell crab - really awful!! 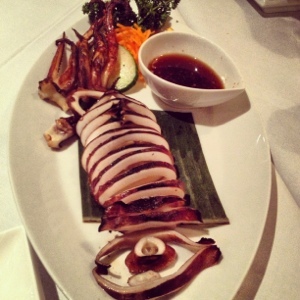 After the veggie tempura and soft shell crab were cleared away, our waitress brought us the grilled calamari - delicious. The tender and perfectly grilled rings of calamari were excellent, we all really enjoyed this dish and quickly inhaled every last bite. My favourite part were the tentacles as I find them to be the most flavourful; a perfect mixture of smokiness and natural sweetness of the calamari. This was an excellent dish and I would highly recommend it to any calamari lover. Just remember it has a very distinct smokey flavour, if you don't like BBQ you may not enjoy calamari this way. Over the years I have eaten at a ton of Montreal sushi hot spots, but I keep heading back to Aikawa Sushi. At my first trip to Aikawa years ago I tried their Besame Mucho chef's special and it was life changing. I had never had a sushi roll wrapped in a soy bean leaf before and really didn't know what to expect. The tender spicy tuna, crispy tempura, perfectly cooked shrimps and sweet soft avocado complimented each other perfectly and left me wanting more. This roll does not have the usual nori or rice like other sushi rolls and it is also accompanied by a special chef's sauce to dip. By far the best chef's special, or so I though, until this past visit when I had their Venus roll. The Venus chef's special is a lightly battered deep fried sushi roll wrapped in a soya bean leaf rather than nori and is filled with spicy salmon, avocado, tobiko, shiso leaf and fried onions and carrots. It was so good, definitely our favourite of the night. We ordered the sushi platter for three which is made up of 47 pieces of chef's choice sushi and one chef's special; the Venus roll. 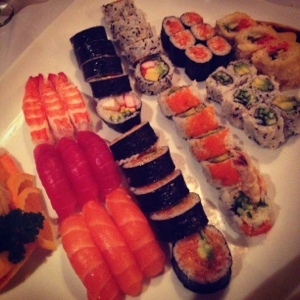 The chef put together a delicious array of sushi and we were pleased with each selection. Besides the Venus special, we were given an array of 6 rolls and three Sashimis; spicy salmon, avocado, cucumber, California, Ebi (shrimp) tempura, Chocobo (fried chicken roll which I am not a fan of but I absolutely loved it this time), Kamikase and shrimp, salmon and tuna Sashimi. The sushi was absolutely delicious, so was the sashimi. The fish was fresh and well prepared and the chicken sushi was a really big surprise for me. As the waitress brought us our sushi platter and began explaining which rolls were which, I immediately freaked out when she said chicken. I never ever thought chicken belonged in a sushi roll, but the waitress assured me I would love it. To my surprise she was absolutely right. The balance of flavours in the roll complimented the crispy delicious chicken perfectly, I must say I really really enjoyed this roll. Our sushi dinner came to an end far too quickly. We left full of sushi and satisfied, except the soft shell crab kept popping back into my head. I really don't know how a restaurant that prides themselves on freshness can serve a dish so horrid. At least we enjoyed the rest of our meal and didn't let that one dish ruin the entire night.